True to their name, GOptions offer a ‘black and white’ expedient service to their clients that will assure their financial interests are realized in a timely manner. While many brokers boast similar claims regarding the transparency of their offers, expedient money withdrawal and straightforward banking system in general, GOptions have taken this to the next level. It is true that majority of legitimate brokers offers honest and straightforward claims, and arguably even a type of service whose quality exceeds that of GOptions, yet few brokers actually focus on high speed. The first thing that catches your eye when you go to their site is a Cheetah in full sprint, which seems out of place anywhere outside National Geographic, but appearances can be deceiving, I suppose. This U.S. broker clearly displays contact information, including a phone number and a chat option, apparently to help you get started, answer any questions you might have or simply welcome you to their site and thank you for your business. The main menu is straightforward; you can start trading immediately, open an account, access banking options, different types of accounts, or find out more about GOptions, in case you wish to make sure they are legit. Finally, there is the list of top 5 trades both on a daily and weekly bases, although it does not appear to offer any reward to the winner other than the bragging rights, though I could be wrong about that. GOptions offers several different account types, including: MINI, STANDARD, GOLD, and VIP, depending on the size of your initial deposit, although you could probably upgrade at a later date. The higher you get, the more enticing the offer gets. 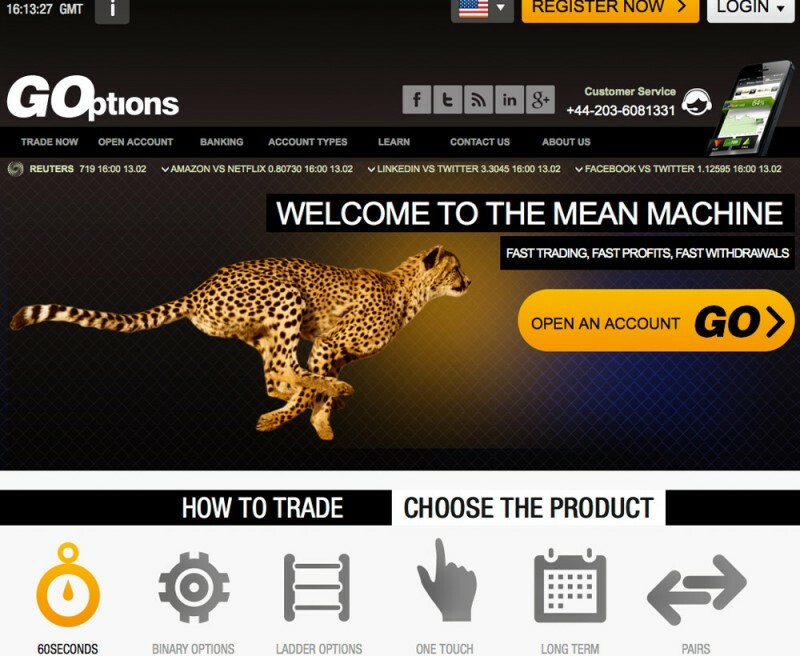 Their platform offers a wide choice of binary options to choose from, and they are divided into several categories. The ‘binary options’ category offers the widest selection of commodities, currencies, indices, stocks and ‘hotAssets’ (the most lucrative of all the other categories) in typical High/Low form. The ‘Pairs’ category is full of binaries which compare one instrument to the other and you need to guess which one will fare better. ‘Long term’ options are essentially the first category with a longer expiry date, whereas ‘turbo’ category is their opposite, with binaries reaching maturity in as little as 30 seconds. One Touch options offer a limited selection, but all you need to guess is whether the price reaches the target or not. The ‘Ladder’ category offers four currency pairs and gold and you need to guess whether their prices go up or down – and that is it. You can also ‘spot follow’ other traders, at your own risk. Finally, you can even trade forex on their platform on the side. As for banking options, GOptions accepts credit cards, wire transfer, Skrill and Neteller as the main payment options. Their bonus scheme is progressive, going as high as 100%, plus 90% max payout and minimum deposit is $200. VIPs get 10% insurance against losses, 4 risk-free trades and more.